UPDATE, 23/7/7: Rash IBA conclusion below. IBA/iSoft significantly under leveraged vs CompuGroup/iSoft. Higher cash & paper counter-offer not unrealistic. It is fair to say that the scribe has been surprised that iSoft did not attract louder bidding interest from either private equity (PE) or trade competitors. But as this 11th hour bid from CompuGroup Holding AG shows, the large lady has been mezza voce rather than finished. Look closely at CompuWho?, floated moments ago it seems in Frankfurt, and who's that peeking out from the shadows? Why, it's General Atlantic, big PE iSoft holder and hitherto curiously absent from the fray. 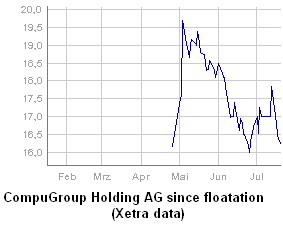 General sold down a circa 66% voting interest in CompuGroup at floatation prices to 16.5% (as of last week). Meanwhile, their iSoft holding, circa 5% and acquired at 214p/share, has long been unchanged. Neat work between holdings, eh? Some claw back is better than none at all. "The interests of Deutsche Bank and its affiliates consist of, as at 19 July 2007, a long position of 82,359 iSOFT Shares." para 17. Wonder where that 21 million went (and at what price) since there is no trace of a transaction by Deutsche on the iSoft RNS announcements between the 9.05% of 28 June and today. Surely all good clean innocent fun as usual though. At least that's what the FSA's market manipulation prosecution success rate suggests. That aside, a marvel of immaculate timing, planning and (so far as this observer would guess) mostly leak free negotiations all round (despite at least two confidently large stakes built up in the last 3-6 months). A final investor note - academia suggests (well, some of it) at this point in a cash bid selling your iSoft holdings and clambering aboard CompuGroup AG in Frankfurt. But have a look at the numbers first of which the 2006 accounts are entirely in German. Presumably that will change as the still timid numerical detail (listen to the conf call questions for entertainment on this count) of the purchase plan is fleshed out. And spare a thought for IBA and Mr Cohen. In the face of cash their tank is surely empty.